This document describes how to register an application as an IBM Food Trust System User, and configure the application to submit credentials and upload data (assets and certificates) to the IBM Food Trust solution. Please refer to GDPR Section on ensuring that no personal data is uploaded to IBM Food Trust as free form text. The IBM Food Trust APIs enable authenticated (and authorized) end users, including system users and applications, to upload data to the IBM Food Trust solution network. To successfully upload GS1 Asset XML and Certificate JSON to the IBM Food Trust solution, authenticated users must submit their credentials with each API call. Once the submitted data is validated and transformed by the solution, the assets and certificates are created on the network and available for transactions with other authorized users. To call an IBM Food Trust API, the application (system user) must have a registered System ID. An Organization Administrator must create the System ID using the Manage Users Dashboard, and manually record the generated System ID, Client ID, and secret (password) for the application. These credentials must then be stored in a form that is consumable by the application—as a configuration file or environment variables, for example. The application submits its System ID, Client ID and Secret in a call to the Authorization API Access Token endpoint. If successful, the API returns an access token (JSON Web Token/JWT) to the application. 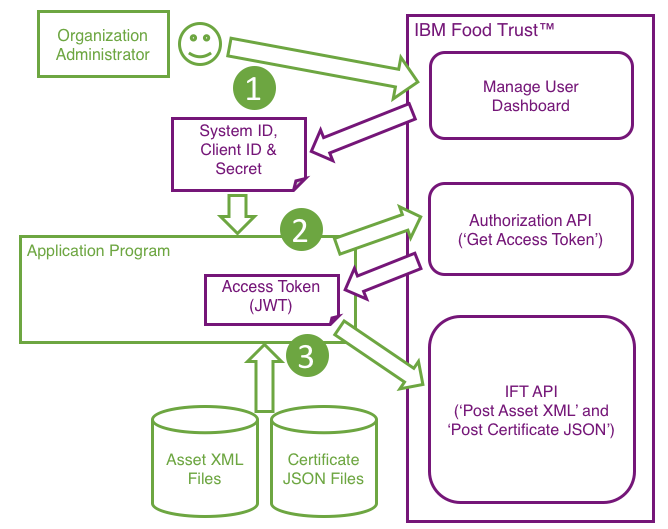 The application submits its received access token (JWT) in a call to the IBM Food Trust API Post Asset or Post Certificate endpoint, to upload assets or certificates to IBM Food Trust. Information about the created asset or certificate is returned to the application. IBM Food Trust requires an authentication to submit data to the system. Please see How To Get an Authentication Token for System Users for detailed information. The IBM Food Trust API documented below is the only API that a customer can access that writes data to the Blockchain. The invocation of this API sends an XML document to Food Trust which is then stored on blockchain. Users must ensure that no personal data is contained in any free text fields in the submitted XML document, or in any comments. When submitting requests programatically to IBM Food Trust APIs, it is recommended that the User-Agent request header is set to a string with the organization name. Optionally, the program name and version can be added to the string. Call the Asset endpoint to submit an XML message to the IBM Food Trust solution in the required message format. For help generating XML messages using a spreadsheet, the Spreadsheet Converter tool is available. POST /fs/connector/v1/assets Submits XML to Food Trust solution. 401: User Unauthorized. A 401 response indicates a problem with the credentials (username/password/client_id) submitted to the endpoint. Ensure that the correct credentials for a System ID, created using the Manage Users Dashboard, are submitted. 400: Bad Data. A 400 response indicates a problem with the uploaded data. The response includes a detailed description of the problem. For additional error messages, refer to IBM Food Trust Solution Errors. 401: User Unauthorized. A 401 response indicates a problem with the credentials (username/password/client_id) submitted to the endpoint. Ensure that the correct credentials for a System ID, created using the Manage Users Dashboard, were submitted.